What is it about that word CON, it seems to precede everything rotten in this world today? CONservative Party, CONtrol, CONfidence trick, oh and my favourite... us ordinary folk, no longer citizens, not even subjects. Bereft of their purported democracy, disarmed and here to be completely ignored. Just as I have little to no time for Putin and his thugs, the same goes for the KSA and their sword weilding thugs. In both cases, I have not seen sufficient evidence to prove or dispove these actions one way or the other. Essentially the Gulf States have us over a barrel: there is enough oil money invested in Western countries such that the Gulf states can exert an extreme amount of influence over our governments. The death of a single journalist isn't of much consequence in the great scheme of things, except to show the complete lack of respect for life the Saudis have. But when it comes to the importation of extreme salafist/Wahabbi Islam, with Saudi money building Mosques and importing Imams, we should really be putting a stop to it or regulating it. But can governments do that without severe impact on the economy of their country? In the UK it could mean stopping arms sales, the closure of container ports, a big drop on the stock exchange, a crash of property prices in London.... in other words severe financial hardship. There is hardly any doubt that SA is one of the most repulsive nations in the world. Everything Raedwald writes is true. I believe their is a Great Game afoot. Post 9/11, and the West's massive intervention in the Muslim world, with Iraq broken, there is a play for the leader of the Islamic world. Turkey, with Erdogan is fast becoming an Islamic nation, and has an aim to become the leader of a proto-caliphate. The Arab world, with SA and Egypt, would prefer that Saudi Arabia take up that role, and demand a permanent SC membership. The outside player is Iran, a potential nuclear state, though America is breaking its economy. All are playing for power in societies in great ferment, as Islam tries to come to terms with the 21st century. So this Khassoggi business could be a Levantine political plot. Levantine politics makes Machiavelli look innocent. Technically Khassoggi is missing, and has vanished. As there is no body, its hard to say what has happened. Khassoggi is no saint. What if this is a Levantine plot to screw the Saudi royal family and Saudi Arabia. It is certainly in Turkey's, ISIS's, Taleban's and Khassogi's interest. Coincidence that this happened just when Turkey released American Pastor Andrew Brunson, to improve its worsening relationship with America. There speaks the mate of Con. "in other words severe financial hardship"
If that is what it takes, better to be poor and free than working as a slave in a Barbary seraglio. Anon 13.50 - I agree. Allowing the subversion of our nation by a foreign power to keep a wealthy clique wealthy stinks. Don't care, the more of each other they kill the happier I am. Raedwald says "we can throw out scores of subversive Salafist imams currently costing the *ordinary* taxpayer billions in police and security" costs"..........IF ONLY YOU COULD, who here has any confidence that yUK.gov has the ability or inclination to do such a thing? Because diversity innit! You now have tooled up plod in the streets threatening citizens if you intimate they might be islamists. You would beggar yUK, for some nebulous belief that you are the GB of yore harassing slavers on the high seas. 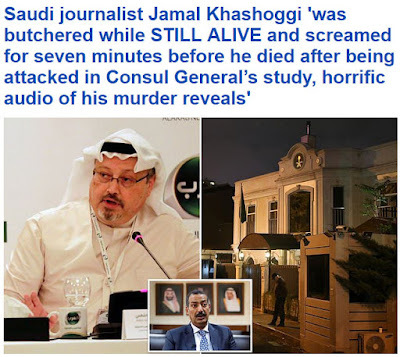 There is such a thing as choosing your fights, Khashoggi is not even worth the loss of ten quid. It seems that the world is drinking at the same UN moron fountain as christia freeland (canaduh minister of disasters) who created a costly problem with KSA by interfering with the wimminz rites. 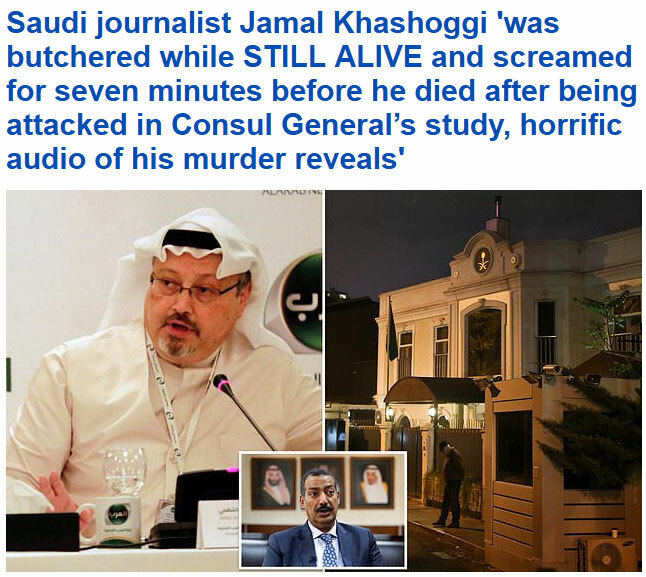 Given that Khashoggi's demise had to be planned well in advance (the hit team weren't 'just passing') there was significant prelude to this event and, probably, a lot more hidden reasons for his disposal. If the audio tapes of Khashoggi's dismemberment are genuine then their broadcast will likely bring about significant change in KSA, certainly in their influence in the region. If the recording was published nothing would change in KSA. It isn’t Kansas. FFS they chop off hands for theft. They don’t share the western respect for life. They respect power. Even a peace treaty is just a truce until the opportunity for an ambush or a stab in the back presents itself. I enjoy reading Con in the Telegraph. You can always tell when he’s had a boozy lunch paid for by the “MoD”. He really should have known better. Poor chap. The programmes on BBC1 about the Assad regime was illuminating. As someone here mentions, they are not to be trusted, nothing is quite what it seems, to them cheating,is their way of life. Its worth considering that this is a region where dropping chemical weapons on your own civilians to demonise the enemy is considered acceptable. Too it can be justified acceptable losses. Particularly so if the gains are great. They are in this case. We are seeing a Great Game for the leadership of the Islamic world with three major players - Saudi Arabia, Turkey and Iran. Yemen, Iraq and Syria are major pieces too. Of course America and Israel are major players. Levantine politics is so murky it makes Balkan politics look transparent.